Futurists, on the whole, tend to be optimistic. On the other hand, Frank Bures wondered last year why many people (at least in the “West”) tend to gravitate to dystopian futures in novels and films. Is this a challenge for futurists? In the here and now Bill Gates points out that the world is getting better, and we have the ability to influence the future. I also noted in a previous post some of the data collated by Gapminder supporting this view. The Economist also highlights the recent Fragile States Index data that indicates the world is not so bleak. The Fund for Peace organisation has been using a set of indicators for the last decade to track how fragile states are. They note that at a global level the world isn’t becoming more unstable, though some countries are (we are watching you UK and USA). Still, the map below shows an awful lot of countries in “warning” and “alert” categories. Finland and other Scandinavian countries come out as the most stable – no surprises there. New Zealand sits at #10, behind Australia and Canada. But we dropped from the previous year. Looking at the data this is due to increases across a range of measures, including poorer economic performance, increasing brain drain, and demographic pressures (including the consequences of natural disasters), refugees and external interventions. This doesn’t make sense to me, since I don’t recall that we have seen substantial changes in these areas over a year. The volatility between years also suggests that the data isn’t probably the best. So, I’m treating those results with caution. 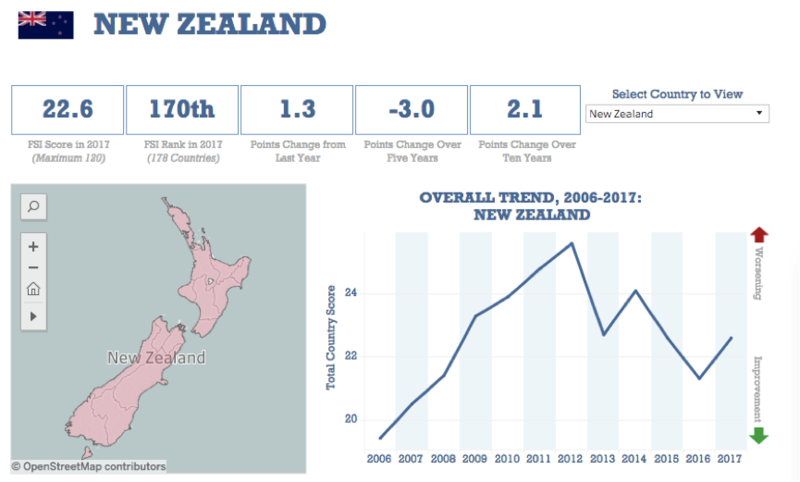 No one would argue, though, that New Zealand is a stable place (seismicity excepted) compared to most other countries. I think the index is useful when focusing on the longer-term trends, but you need to delve into the data more deeply. And there are more refined indicators available for particular themes, such as the NZ Deprivation Index and the Regional Economic Activity data released by MBIE. We can read too much into the dystopian views of fiction. Most science fiction writers aren’t futurists. They tend to reflect concerns about what is happening when the story is being written, rather than being prescient about the future. Not all sci-fi is negative either. But we tend to be drawn to darker stories anyway (crime novels anyone?). Especially if they are about overcoming adversity or solving a problem. Still, they can help stimulate useful discussion about emerging issues. Most people tend to focus on what isn’t going well, or seems more concerning. Despite longer healthier lives, less poverty, and greater stability, there are things to be concerned about – wars and civil conflicts, spreading authoritarianism, economic inequality, environmental impacts, and global effects. One of Bures’ key points was that science fiction stories now focus on more complex apocalypses than those from last Century. Today our fears are broader, deeper, woven more tightly into our daily lives, which makes it feel like the seeds of our destruction are all around us. We are more afraid, but less able to point to a single source for our fear. At the root is the realisation that we are part of something beyond our control. That rings true. But it shouldn’t be a lamentation of defeat. That can read as slightly melancholic. But Musk is doing more than just thinking, he’s shaping. Science fiction writers and futurists (not mutually exclusive occupations) both serve to explore implications of trends. The former via narrative, the latter, hopefully, through analysis and diversity of thought linked to actions. The role of good futurists – I’m using that term as a shorthand for practitioners of foresight, rather than travelling hucksters peddling predictions. The role of good futurists is to help others shape a more positive future, and unpick how to get to it. Their challenge is three-fold. Firstly, to overcome skepticism that they are providing anything useful, and is not just of entertainment value. Secondly, ensuring that both the “good” (which will depend on your values and attitude) and the not so are carefully examined. This requires examining both the lighter and darker angles associated with change (and the status quo too). Thirdly, they need to unlock both pragmatism and optimism. The world may be becoming more complex, but there are ways to address that complexity. Futurists need to generate confidence, not certainty. Is there anyone who focuses on a brighter future? Are we all so defeatist that we take it for granted that the dark future will prevail. Science fictions or science satires? I’m glad you asked Julie. Neal Stephenson set up the Hieroglyph project to stimulate writers to create more optimistic futures. An anthology is out. There are also various lists of more optimistic sci-fi stories (although the optimism can emerge after the collapse of civilisation). Good to see an Elon Musk reference in an article about our future. He is a man that will change the world. Capitalism needs to be abolished if the world is to have a future, for when to many people are below decks in a ship, there is mutiny. Elton Musk is the capitalist dream writ large. Significantly, his technologies use standard physics (or perverted as you suggest) and seem to work fine. Give up on Tesla, it was 120 years ago. If his ideas were truly better, we’d be using them by now – after all, they are so open domain even amateur commentators have access to them. They’re trolling us with the “angle” thing, right? 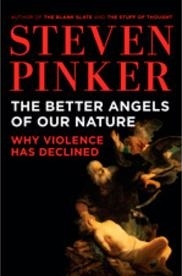 No, it’s a subtle play on “Better angels”.